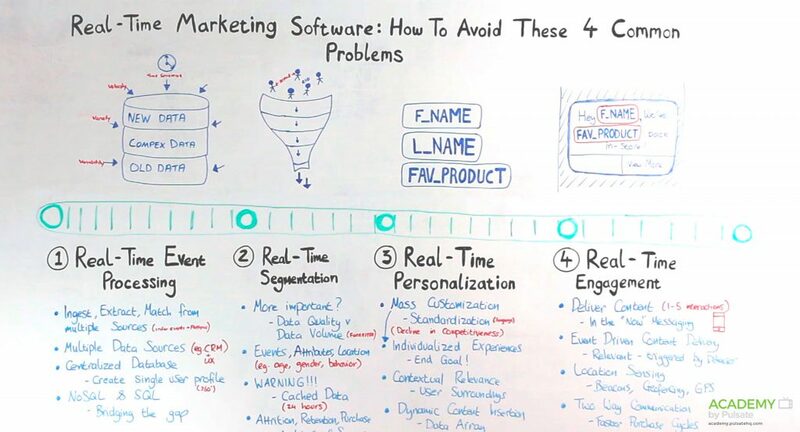 Real-time marketing for mobile apps: Avoid these 4 common problems! Did you know that 59% of businesses plan on increasing their real-time marketing budget within the next year? 98% have already reported a positive impact on revenue just from real-time marketing. Hi, my name’s Johnny Walker. I’m Product Designer here at Pulsate, and I will be giving the first of a five-part series on real-time marketing, and the four elements you must consider. So, let’s get started. So, let’s just do a quick overview of what we’re going to look at today, but also what is coming in the next four episodes of real-time marketing for mobile apps . So the first step, it’s real-time event processing, then we have real-time segmentation, we have real-time personalization, and then finally we have real-time engagement. And this is what we think at Pulsate are the four stages really to delivering real-time marketing experiences. So, with real-time event processing, we’re dealing with data. And as you probably already know, data is always going to be old. So, it’s just depending on your organization, how old that data can be. So, with real-time event processing, what is happening is, we’re ingesting, we’re extracting, we’re matching data from different sources. And what we want to do is we want to create a centralized database, a single user profile of each individual customer. So, for example, with the multiple data sources, that could be from social channels, it could be from your CRM, and the thing with CRM is the information that is contained here, it’s very personal, it could have your customers first name, their recent transaction history, information that you can take and start using when you come to the personalization stage. So, it’s key here the information can travel all the way to the personalization stage very quickly. And we’re going to go through that in real-time segmentation and real-time personalization. So, the creating the single user profile it’s extremely important because you don’t want to have user profiles of your customers that are stored in different silo’s of different databases. So, one of the common problems is basically a lot of companies have Legacy systems in place, so they’re connected to SQL servers that are probably on-site. So, now with modern web applications most of them are non-SQL, so how do you combine SQL and non-SQL and get that information, and bring it into a centralized database? And that’s just one thing that’s been overcome in the past few years where people are actually able to take that information, and create that single customer profile. So, that single customer profile, that information really will be connected to the real-time segmentation, so that you can segment against the CRM data, you can segment against the social data, you can segment against the custom events, and attributes of a user based on their app behavior for example. So, real-time segmentation, before you even decide on what information you’re going to keep, it would be a good idea to consult with your CIO so that you know exactly what information you need, because you don’t want to be segmenting through data that is not really going to be that relevant. So you need to decide on what information you want to keep, and what you don’t. And Forrester done a study on this, and they were asking questions to people in companies, which was more important, was it the volume or the quality of the data? And the quality of data is what people said was more important to them, because they’re able to deliver a more personal experience, they’re able to process and extract information from data, and insights much quicker that way. So, events, attributes, and location, these are three elements that you really want to segment your data against. We will go more into location over when we look at the real-time engagement because there’s some really interesting things around here. Very few platforms will start giving the option really to segment on location data. A lot of platforms just let you do events and attributes. So, one thing to look out for when you’re looking at a platforms and a decision that you’ll have to make as we mentioned here is like, how old can data be? And many platforms, they will cache data for 24 hours, so that means events that happen let’s say, right now, that information is not going to be passed to the segmentation engine for up to possibly 24 hours. So you can’t really do real-time marketing if the information you’re getting is old and obsolete by the time it gets here. So that’s a very important question that you ask your vendor when you’re looking at different platforms. So, real-time segmentation, something that kind of ties in with it is analytics. So, you should be able to analyze your attrition, retention, purchase cycles, and Patrick’s doing some great videos on this in the Mobile Metrics series, so you should have a look at that. But my point with this is, when you have, you run a campaign, and it’s finished, you have that information, you should be able to segment against that campaign, so you can use user attributes, demographics. So, you want to see where most people, let’s say, in New York opened that campaign. So you want to start building up more cohorts of users, basically insights from what’s happened. And then you can save these as mini-segments for a future campaign that you’ll be able to use here in real-time marketing. So, that’s just a very high-level overview of the real-time segmentation. Next, real-time personalization as we mentioned before, we’re taking the information from the database here, CRM and we’re able to feed it in here. So how does that work? Basically, what we’re doing is we’re using dynamic content insertion using key value pairs, and what we’re able to do is, we’re able to mass customize experiences for users that makes them feel unique and individualized. So, with mass customization, it really is important, because many years ago, it was quite the opposite where standardization was the key for competitive advantage. Where now that is actually disadvantage for a company if they can’t mass customize experiences for users. So, the key here is to create an individualized experience for each user just to make them feel special, that they feel unique, that you’re looking after them, you’re not forcing stuff on them that’s of no interest to them. And that’s where segmentation and event processing will help to make that experience very unique to that end user. So, some of the stuff here like, contextual relevance, I’ll talk about that actually in the real-time engagement, because contextual relevance is basically the user surrounding. So having that kind of information and personalize their experience based on where they are, you’re going to use some sensors that I’ll talk about here in real-time engagement. The real-time personalization, just as an example, you could have here, “Hey, first name, we’ve got your favorite product in stock.” So in your database you might have a flag set for favorite product, so you know each one of your customers favorite products. So dynamically, we’re able to insert each user’s favorite product in a message that could go to millions, and it’s personalized to every single person. So that’s something really good if you’re looking to increase revenue, of course, being able to personalize something like that, it’s going to greatly help. So real-time engagement, what we’re wanting to do is we’re wanting to deliver content in the now. So, it’s not premeditated as such, it’s when the user does something in a certain location, then this should happen. And that’s really what we’re trying to do here in real-time engagement, and it is the Holy Grail of marketing, for marketeers to be able to do this, and for companies to be able to do this, to be able to relate with users in real-time. So we like to call this event-driven content delivery. So when the user does something in a certain place, we’re able to do that. And we’re able to do that, because we know stuff about, like locations. So with location hardware such as Beacons and then also we have Geofencing, and then we’re able to look at the user’s last known GPS coordinates to be able to deliver these experiences. Now, to be able to combine events, attributes, and location, you’re going to be able to create far granular experiences for your users. So for example, before, you might have been able to use events where customers in the store, because they pressed a buy button, and they’ve created an event, then something happens after that. But now, maybe a customer is in-store, they press a button, and that event is recorded, but because there’s a Beacon in-store, that location data combined with events is able to create far more advanced opportunities for you as a brand. And finally one of the key things is to be able to have a two-way conversation with your users. So, it’s not all about you pushing message to your customers, it’s about them being able to send information back to you also as a brand, and as an app owner, and to be able to give you feedback, and just to have an open conversation with your customers. So, just to recap, we had real-time event processes in where we ingested, we extracted, we matched data from different sources and brought it into that centralised database to create that single user profile. We then had real-time segmentation which is taking that information, that data, and then being able to segment it in real-time based on events, attributes, and past location information. And remember about cached data, you need to make sure that if your data is time-sensitive and it is cached, it’s probably only going to be cached for 24 hours, and then that’s going to prevent you from doing true real-time segmentation. So make sure you check that out. real-time personalisation was like mass customisation of individual experiences by using dynamic content insertion. So you have your first name, last name, could be products, any kind of events, attributes you could dynamically insert here based on the app user. And then finally, we had two-way communication in real-time engagement, and also the importance again, of using location sensing such as Geofencing and Beacons just to make that whole experience very real and contextualised. So, that’s pretty much it for this video. I look forward to seeing you in the rest of the series. And if you have any comments, feedback, please just leave them in the comments below, and you can get us on Twitter @PulsateHQ. So, thanks for watching, and I look forward to seeing you soon.